The undated photo shows the firing of Yemeni missiles at Saudi positions in retaliation for Riyadh’s brutal aerial campaign. 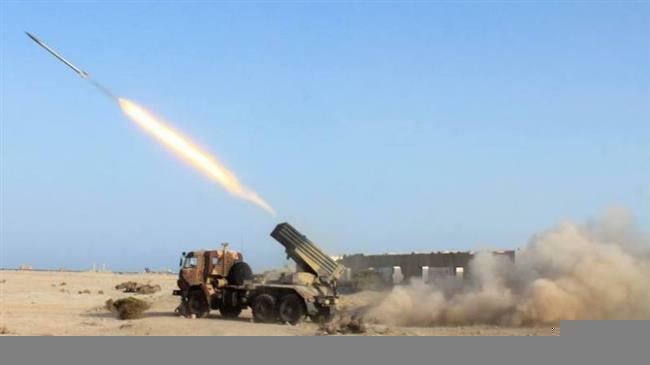 Sana’a(ANN)-Missile units of the Yemeni army and volunteer forces from Popular Committees have reported firing domestically-built ballistic missiles that targeted Saudi Arabia’s military positions in Najran and Khamis Mushait. No report has yet been released on the outcome of the missile strikes on Friday. Yemeni forces regularly fire ballistic missiles at military and economic targets inside Saudi Arabia in retaliation for the Riyadh-led brutal campaign against the impoverished country. The development came a day after Yemeni forces reputedly killed a number of Saudi mercenaries in the west of the country. Citing a military source, local news outlets reported that Yemeni forces destroyed an armored vehicle with a guided missile in al-Fazza area, south of Yemen’s western province of Hudaydah, on Thursday. Saudi troops and their mercenaries are currently pushing to seize the Yemeni port of Hudaydah, through which the bulk of international humanitarian aid enters war-torn Yemen. A separate report by Yemen’s Arabic-language al-Masirah television network on Thursday said Yemeni snipers had slain at least six mercenaries in Yemen’s western province of Ta’izz on Wednesday, adding that they had also managed to destroy a military vehicle in the Jabal Habashi area, killing an unspecified number of mercenaries travelling in it. The report added that Yemeni forces also attacked gatherings of mercenaries with heavy artillery fire in Saudi Arabia’s southwestern province of Jizan, killing an unspecified number of them and inflicting damage on their hardware and equipment. Saudi Arabia and its allies launched the war on Yemen in March 2015 to install a former regime that had been loyal to Riyadh. Several Western countries, the United States and Britain in particular, are accused of being complicit in the aggression as they supply the Riyadh regime with advanced weapons and military equipment as well as logistical and intelligence assistance.